Flowers fashioned from zippers (yes, zippers! ), rings with buttons adorning them instead of diamonds, place mats made of burlap...if you're into unique, hand-crafted accessories for your wardrobe or your home, then The Tattered Flower Etsy Shop is a stop you need to make. Linda owns The Tattered Flower and is also the creative guru behind the Craftaholics Anonymous blog. In February, she decided she'd like to fund her crafting obsession, and the Etsy shop was launched. Since the launch, Linda adds new items to the shop almost as often as she produces fun and fabulous tutorials on her blog. What I love about Linda's creations is that while they have a special, boutiquey feel, she doesn't charge boutique prices! As I browsed the shop, I was so pleased to see that even though she keeps her prices low, The Tattered Flower doesn't sacrifice quality and workmanship. Spring will be here soon, and I've already bookmarked several pieces that will update my look this year! To celebrate the launch of my Sponsors section, The Tattered Flower is doing a GIVEAWAY! Please visit The Tattered Flower and then come back to leave me a comment telling me what your favorite item in the shop is. Entries will be accepted until 5 pm (ET) on Sunday the 21st. I'll announce the winner on Monday and get you in touch with Linda. This contest is open to residents of the continental U.S. only. This stuff is so cute! I have never seen it before. I have 3 favorites...the zipper daisies, the spring burlap pillow and the rosebuds necklace. Thanks for the opportunity! I love the zipper ruffle gray flats and the zipper ruffle headband! Great giveaway! Thanks! I love the Gray Ballet Flats - I wear flats all year round and love that color! I also love the argyle bracelet! So cute! I like the placements best. And the bracelets. But her still is all cute, and you're right: her prices are SO reasonable! Kind of amazing, really! I hope she gets lots of new business from advertising here at your place. Oh cute! I love the spring burlap pillow! How fun! She is so nice and talented too! I love the zippered shoes and the zippered headband! Fun giveaway!! Ahhh...any of her headbands adorned with flowers are my absolute favorite! I've been seeing those everywhere lately too...even on idol the other night! lol! The hot pink or red shoes! I love them! I clicked on her link before to check out her store, she has really really great stuff! Darling lil rings! How wonderful. I am gonna peek around a bit, mind if i follow? Also, I wanted to tell you thanks for the comment on my blog. I love them, and Always enjoy meeting new bloggers! What a fun giveaway :)! Ok, how to choose? I'm seriously in loooove with those grey zipper ruffled shoes!!! But the black zipper cuff bracelet also catches my eye...and then there's the burlap placemats, oh my! :) Darling & fun shop! I like the spring burlap pillow. All her items are very unique! i neeeeeeed that white zipper flower chain necklace, and the headband, and the black zipper cuff with the rhinestone. omw, thanks for the link to this site!! I love anything with zippers on it. My fave is the zippered ruffle headband. I am sucker for unique headbands. Congrats on your launch! What a fun giveaway. Hard to decide a favorite - the flats are very cute. I also like all the gray whimsical flower accessories. Hooray for your new sponsor section! That's great, Amanda. And what a fun giveaway to celebrate. I love those red ruffle ballet slippers. Too cute! Count me in! 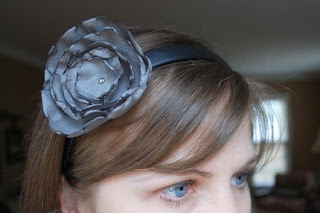 I LURVE the black zipper ruffle headband! Love the white zipper flower necklace. Those argyle bracelets are pretty spiffy too. I love the ballet flats and the burlap placemats, too cute! 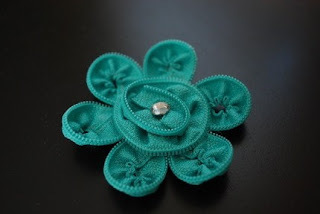 I love Linda's blog and I think my favorite item is her gray and black tulle flower brooch pin, but I love most of the things she makes! oooh- what a talented woman! those rings are so beautiful & unusual. honestly, i think the rings are my favorite, but i also like the placemats a lot... may have to order those! and the gray ballet flats- so sweet. I love the Spring Burlap pillow! So cute! I love the ruffle on the shoes. All of her stuff is so cute! I love the zipper ruffle headband! It's hard to pick just one thing, they are all so adorable. I especially like the argyle bracelets and zipper flower rings and headbands!! Wow I adore the lipstick red zipper flats - amazing. i love the black zipper flower. i have a jacket it would look so great on. her prices are awesome, too. i'm having a little giveaway on my blog. please come by. it's to showcase my daughter's etsy store that she just started up. the odds of winning are very good since i've only had 3 entries, hah! I would love a size 5 pair of hot pink ballet flats. Too stinkin' cute! Thanks for the chance to win. I love the head band. I follower her blog what a crafty lady. I love her zipper flats! 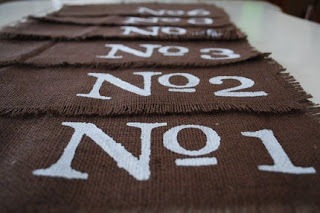 Love the numbered burlap placemats and the zippered shoes and headbands. She does great work! I love the zipper ruffle ballet flats! I want a pair in every color!! That store is wonderful! I absolutely love the Spring Burlap pillow! it is so adorable! the prices are great too! I love all of her zipper items. I dream about them! My favs though are the ring, the ballet flats and most of all the bracelet.